The British Museum, located in London, UK, is an enormous collection of priceless artifacts that explore the history of the entire world. Visitors should come prepared to spend an entire day, as well as understanding that it may even take more than one visit to see everything. The British Museum can be traced back to a single man, Sir Sloane, and his willed collection that, in 1753, formed the basis of the collection. It opened to the public in 1759 and now boasts over six million visitors per year. The museum is broken up in galleries, each focusing on a specific subject or area of the world. Below are just a few of the many choices to view while there! Africa - This exhibit explores the diverse culture that makes up the continent of Africa. Focusing on everyday objects as well as works of art from the area that reach all the way back to ancient times, the museum houses a collection of over 200,000 different items from Africa. Make sure to check out the Yoruba ruler brass head from Nigeria, a sculpture that is made out of weapons/guns called Tree of Life, and the many different textiles and sculptures on display. Ancient Egypt - The Ancient Egypt exhibit is broken up into a few different subcategories (sculpture, death/afterlife, and specific areas of Egypt like Sudan and Ethiopia). There are many large-scale sculptures on display, as this was a frequent medium of the ancient Egyptians and were thought to be able to possess spiritual qualities. Check out the Ramesses II stone bust, the world-famous Rosetta Stone, and the area focusing on the way that Egyptians treated death, the burial process, and the afterlife. Ancient Greece and Rome - Another multi-tier exhibit focusing on both the history and the various areas of Greece, the exhibit on Ancient Greece features many different sculptures and historical artifacts including a signed vase of Andokides, the leader of a group of potters and painters who worked in Athens, Greece in the end of the sixth century. There is also a section on the Parthenon, the temple that was dedicated to Athena herself. Europe - The section of the museum focusing on Europe decides a large exhibit to the history of Europe from medieval times through today. With a room full of watches and clocks (hundreds of working, ticking clocks), to areas focusing on the material culture of Roman Britain, this comprehensive history walks visitors through how Europe has developed as a whole and how they have gotten from ancient times to where they are today. Middle East - Obviously, as large as the Middle East is, the exhibit focusing on this geographic region is also one of the largest in the museum. Starting with Assyrian sculpture (large winged lions that were located at a palace in what is now modern Iraq), moving through the Islamic world (taking a close look at faith, science, and art and how it all relates together), and going through Mesopotamia and Iran, this exhibit is incredibly moving and awe inspiring, as well as being very educational about an area that is often misunderstood. There are many more galleries to discover as well, and guests should plan to stay all day to experience them all! 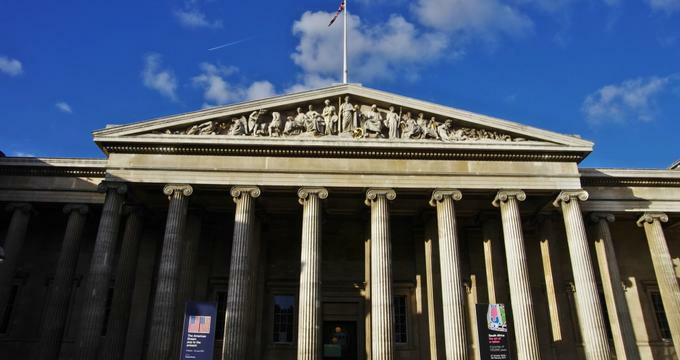 The British Museum hosts a large selection of educational opportunities for school groups, all designed to cater to the specific needs of the age/grade level and topic of the field trip. The website holds a large amount of information about each option, including cost and recommended age level. Self-led tours are an option, as the website holds a large amount of information meant to prepare teachers for the visit with resources, informational sheets, and other activity ideas for students. For teachers looking for a little more guidance from their field trip and visit, there are options for various workshops, special exhibit viewings, and other guided tour opportunities. Call and schedule with the museum, making sure to have options for dates, number of students (and adult chaperones), the galleries students need to visit, and any special access being requested. Teachers can also book a lunch area ahead of time, if needed. It takes roughly two weeks for visits to be confirmed. The British Museum has a few dining opportunities for visitors who get hungry while on campus. There is the Great Court Restaurant, which is an elegant sit-down experience, and the Pizzeria and Court Cafe for those who prefer to eat quickly and get back to exploring. There are also combination offers with special exhibitions, occasionally, as well as family dining areas.